Painting a Bullseye on Damascus? 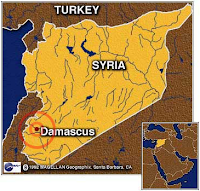 In bible prophecy, Isaiah 17:1, we read of a terrible fate that is to befall the city of Damascus - one so terrible that Damascus will no longer remain a city in its wake. Rather, it will be left a "ruinous heap." Isaiah 17:1: The burden of Damascus. Behold, Damascus is taken away from [being] a city, and it shall be a ruinous heap. While some believe this prophecy to have been fulfilled in the distant past, Damascus is considered by many experts to be the longest continuously inhabited city in the world. Thus, I have long suspected this prophecy holds significance for the future as well. That Syria has constructed another nuclear plant, after Israel leveled its last known one in September of 2007, comes as no surprise to me. What is striking to me, however, is the Syrians have chosen to place their new facility in perfect position for Israel to bring to Damascus a severe destruction in keeping with Isaiah's prophecy, the fact that Iranian warships recently passed through the Suez Canal en route to Syria only serving to heighten tensions. Let's do the math on all of this, shall we? According to United Press International, a U.S. intelligence report indicates Iran has resumed work on obtaining a nuclear weapon, refuting a 2007 report that the Iranians had ceased in their efforts. Add the new Syrian nuclear facility with Iran's ongoing quest to obtain nuclear weapons as well as the arrival of military vessels from Iran in the Mediterranean en route to Syria and an ominous picture emerges. Prior to the 2007 Israeli attack on the last Syrian nuclear facility, a ship from North Korea arrived carrying what Israel believed to be nuclear equipment. At a moment like this, one can't help but wonder what may have been onboard the Iranian warships bound for Syria. Could it be another military showdown is about to occur between Israel and Syria, Iran having played a role in creating the confrontation? No one knows for sure, but a miscalculation on either side of such a conflict could result in a nightmarishly deadly exchange - one that could swiftly add up to the fulfillment of Isaiah 17:1.